60’s Tribute Act Mel Harris – Reviews and Quotes. Deciding that the NASHVILLE TEENS had monopolised the stage with their own gear, MEL HARRIS chose to perform his two sets from the dance floor – and why not? There’s nothing like mixing with the crowd! MEL plays covers of sixties numbers. Nothing special in that, although we did have good reason to believe, from the evidence of a recent cassette, that we were in for a treat. However – we didn’t reckon on him being a future “star” into the bargain. The man has it all. He looks good and has an easy going rapport with the audience. His show is a non-stop onslaught of sixties classics ranging from Roy Orbison to The Searchers and Gene Pitney to Gerry & The Pacemakers. All were superbly performed with the help of some truly excellent guitar work and the aid of a sequencer. MEL’S vocals are both clear and powerful and certainly more than do justice to the original artists whose songs he now expertly reproduces. A couple of chosen instrumentals gave another facet of MEL’S considerable talent to shine through and with several respected professional musicians in the audience giving their unanimous approval to the highly original and entertaining show, I beg to offer the opinion that we were witnessing a future headliner in action. If you ever find yourself staging a Sixties show and want to provide first class entertainment but cannot afford a name band, I would suggest that MEL HARRIS could well be the answer. But be quick, before he finally gets discovered, and when he does, remember – I told you so. I’d hire MEL HARRIS anytime. 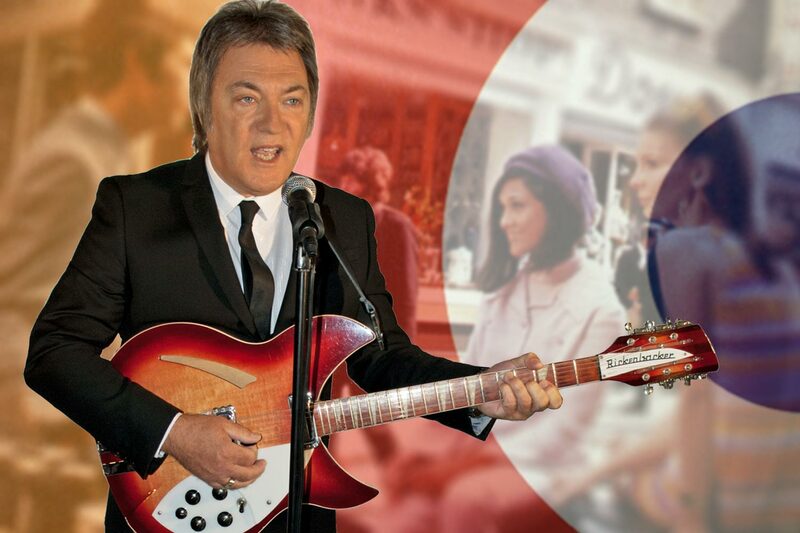 Often found backing 50s and 60s groups, he’s terrific solo, playing guitar with a real swinging sixties feel, sounding vocally like a cross between Gerry Marsden and Paul McCartney. His wide repertoire for the showcase was good to listen or dance to. MEL HARRIS is established and popular across the country appearing solo with guitar plus the best and latest in technological backing. He covers famous sixties hits, performs a lot for Charringtons and enjoys his work. Yesterday Man, Lets Dance and Young Girl being a few of his well-arranged resurrections. MEL HARRIS, always early, always eager and ever young (!??? Mel) – specialises in presenting covers of famous sixties hits. Entirely looking the part, he plays great guitar reinforced by the latest computer technology. Ask for any number of the decade and he can twang it off – I’m A Believer, Lets Dance, How Do You Do It, and not surprisingly, he has a large following. We reckon that Londoner, MEL HARRIS, is, undoubtedly, a star of the future. The name may be new to you at the moment but we are predicting great things for this young man who is able to recapture the classic sounds of the sixties in his own complete one-man show. MEL has, in recent months, supported many of the countries top sixties acts, including The Troggs and The Swinging Blue Jeans, and is fast earning a a reputation as a performer of the highest class. Impressing fellow musicians is never an easy thing but many of out top sixties stars are in agreement that MEL HARRIS is a special talent. When someone attempts to re-create the great songs of the sixties they, more often than not, risk being compared unfavourably to the original artists. Very few people are able to recapture the authentic sound of the original recordings. MEL HARRIS is an exception. Whether, it’s Roy Orbison, Gene Pitney, The Shadows, Gerry & The Pacemakers or Bobby Vee – they all receive the same brilliant treatment from MEL. Close your eyes and listen – can you tell the difference from the original? MEL HARRIS, to date, has recorded two cassettes featuring some of the best loved songs from the golden decade of music. Chances are that at least one of his albums will be on sale wherever he is appearing. Watch out for the name of MEL HARRIS because one day very soon he will make it to the top, and when he does, remember – we told you so. 2000 Introduced on stage at the Brighton Centre by Brian Matthew, 60’s DJ legend! 2010 20 years of the 60s Show! !